The world's first introduction to the Dodge Neon was a simple TV commercial that exclaimed "Hi!" 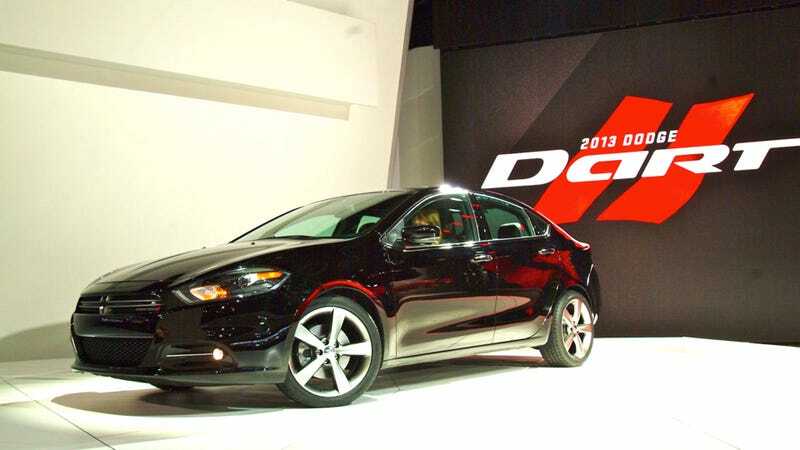 Our introduction to the 2013 Dodge Dart at the Detroit Auto Show was an admission that, since the Neon's introduction, the company hasn't done much in the compact space to get excited about. It's worth mentioning the Dodge Neon because, although this car carries over some design cues from the Alfa Romeo Giulietta on which its based, if you squint your eyes you can almost envision a world in which the Caliber never existed and the Neon continued to be a winner for Chrysler. This is intentional. I was sitting next to Dodge President Ralph Gilles during the debut and mentioned this, to which he replied "We held a funeral for the Caliber, but no one showed up." As previously discussed, this first Fiat-based Chrysler will come with a trio of engines: 2.0-liter Tigershark, 1.4-liter Turbo MultiAir, and 2.4-liter Tigershark MultiAir2. Ignoring the rental-grade 2.0-liter, the 1.4-liter engine puts out 160 horsepower and 184 lb-ft of torque and comes with the optional dual-clutch six-speed transmission. The top-o-the-line mill is the 2.4-liter, which puts out 184 horsepower and 171 lb-ft of torque. At least one of these new vehicles will get 40 mpg (we assume highway) and start at $15,995 when it goes on sale in the second-quarter of 2012. Chrysler's jamming the new vehicle with features, including an optional TFT digital gauge cluster drivers can customize to their preferences. If this doesn't provide enough digital distraction there's also an 8.4-inch touchscreen available in the dash. Just a few years ago the Big Three offered a Cobalt, aging Focus, and embarrassing Caliber. Now we've got a reasonable Cruze, sporty new Euro Focus, and this.